Today we have asked Allison Harris of Cluck Cluck Sew to be our guest. We have fallen in love with her patterns. You may have seen the quilt from market that featured a new line of fabric, Ten Little Things by Jenn Ski. We thought one of Allison’s patterns was a perfect fit to showcase this new line of fabrics that will be in stores March 2012. 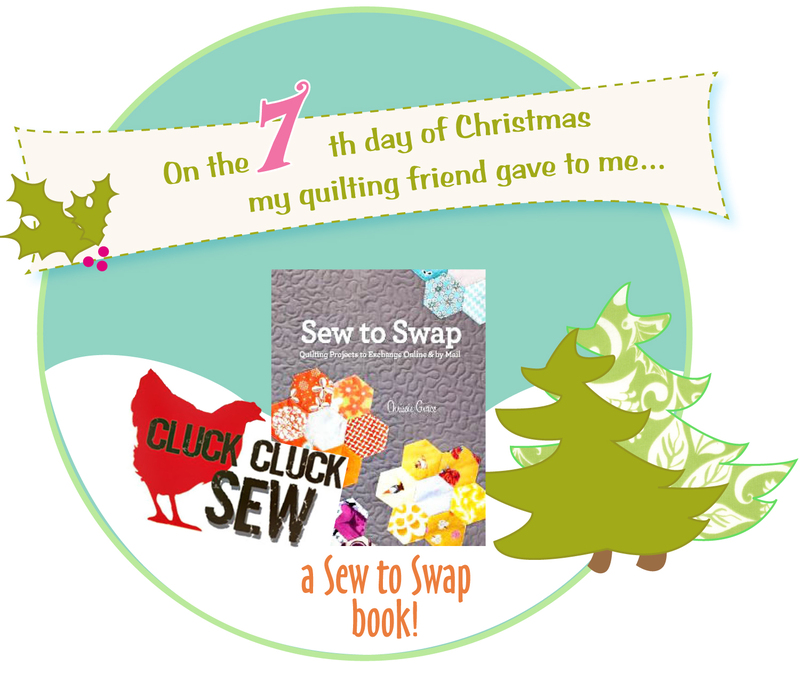 My name is Allison Harris from the blog Cluck Cluck Sew, here to share with you the 7th day of Christmas! I blog sewing and quilting tidbits and tutorials, and design quilt patterns. My latest pattern looks very cute in Jenn’s fun boy fabrics as shown below. This quilt was quilted by Alicia Key. She quilted roads in the sashings and even added some mixmaster highways in the cornerstone sections. What little boy wouldn’t play for hours driving his hot wheels along the pathways? Gather a group of quilting friends and start trading fabric, quilt blocks and full projects for the ultimate community sewing activity! This fun book will show you the best way to organize and run your very own swap while making 12 beautiful projects. Whether you form your group in person or virtually online, you’ll love the excitement of giving and receiving handmade items. *12 fully illustrated patterns for full-size quilts, pillows, doll quilts and more featuring your favorite designer fabrics and color combinations. *Detailed how-to instructions for organizing, running and participating in 10 individual swaps using the patterns in the book. *Interviews, patterns, blocks and quilts from 17 of your favorite blogger personalities. *Fun and inspirational projects that you’ll love making, even if you don’t swap a thing! What a fun adventure for you and your friends! Just stick a copy of this book in your best friends stockings and then get to planning your very own Sew to Swap! join all your friends together this Christmas. Check out Amada’s Farmer’s Wife Quilt Along as she is one of the gals that started it all!! This quilt along is sure to bring ALOT of laughs and great memories among your quilting groups. So, on the 7th day of Christmas, we suggest creating great memories with your dearest friends. 2. Leave a COMMENT on the blog as to why you want Santa to bring you this Sew to Swap book and a good memory you have with your friends! To be honest. This is something I would not have given a second look (and almost didn’t) until I saw what you created with it. So now my mind is spinning and I sure hope Santa puts this in my stocking so I can play…. Follow along & comment each of the 12 days FOR 12 chances to WIN! You will be entered to WIN the Grand Prize for each comment you make! 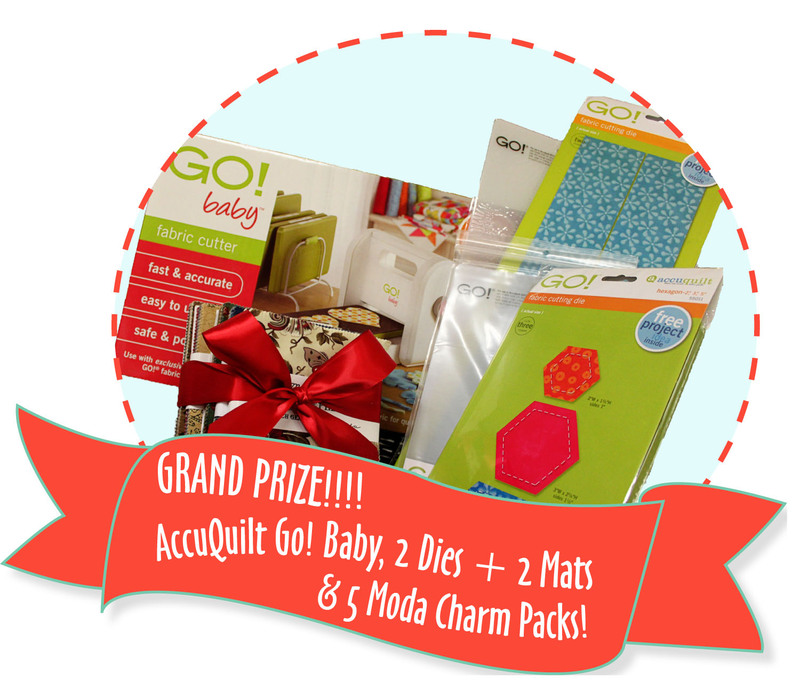 Also CLICK HERE to sign up for AccuQuilts fun emails! I’ve always wanted to get into block swaps..and this is just the way!! This looks such a great book – I’d love to start swapping!! Quilting and sharing, that’s what it’s all about. A friends “eye” and input keeps it fresh. Sounds like a great book – would love to win! Swaps are so fun. I’ve seen so many on the various blogs. Thanks for sharing! I would love to have ideas for a swap! My title in our guild is Mistress of Fun Stuff. I think up the guild challenges and I believe a block swap would be a fun venture. I could use this book for some ideas. What a great book and ideas. Would love to win.. Thanks. I’m in a quilt group and we do a swap every year. I sure need some new ideas from your book. Yay to yesterdays winner. I would love this book. This book would also be a great addition to the coffee table! I LOVE your patterns and would absolutely love to have a copy of your book about swapping –I believe in swapping!! The coolest kind of sharing. Thaks for the give-away.too. I have never done a swap but it sure sounds like fun! Thanks for the chance. I am part of group of five friends who like to “run away from home” to sew, knit, embroider, or whatever each winter. We set aside a weekend and rent a large suite at a hotel away from home, but well within driving distance. It is great fun. As an out growth of this group, those of us who sew meet about once every six weeks at a wonderful spot to keep up with life and sewing projects….and tutor the newby sewist with her new machine! I love quilt books, and I have always wanted to try a swap! Looks like a great new book! I’ve never done a swap; but would love to try. I have never done a quilt swap before. But i LOVE LOVE LOVE Cluck Cluck Sew!!! i have been a follower of her blog for a long time! I love to do swaps and round robins. Over the years I’ve done many and am always inspired by the creativity of others! One of my favorite friend memories involves a button party my friend hosted. She came into a huge amount of buttons from an old clothing manufacturer and filled every bowl in her home with them. The bowls covered every flat surface in her living and dining room. We selected buttons from each bowl and all went home with baggies full of buttons! So much fun! Congrats to yesterday’s winner! Would love to win this book. The swapping idea sounds so fun. Sounds like a great book for a beginning quilter!! I just participated in my first fabric swap, so I’d like to move on up from there!! Thanks for the opportunity! I love to swap and am so excited to see this book in person!! My friend and I have done many swaps together and I hope to do many more in the future!! I do follow this blog. Swaps are so much fun, and I bet this book has some great ideas for them! What a great book! Would love to find this in my stocking! Looks like a fun book! Our little quilt group might be looking for a new project next year! Love swaps and I love your giveaways! Looks like a great book 🙂 Would love to try a swap!! I’ve never done a swap before. But since my youngest son is now in college I may like to give it a try. I was in a blockswaponce and unfortunately it as quite a disappointment. But this book would give some great ideas. I would love to try a few swaps with these patterns. Good memory: my collegue/friend and I , both having a fulltime job and a baby, went to a cute french restaurant (very fashionable in those years) to have dinner as a special treat. And it became a tradition: once a yr. we had a great night out and a lovely dinner. It was our special evening. We did it till she moved to another country. What a great book. I’d love to win Sew to Swap. Lana D.
I haven’t seen this book before…I’d love to do a sewing swap with my friends! I’ve sewn with a group that all makes their own personal version of the same quilt, but we’ve never made blocks to swap. Looks like this book could be a whole new idea for us! What a fun book. I would love to join a block swap, sounds like alot of fun. I have way too many good memories with friends to pick just one! I’d love to win the book so my friends and I could make even more good memories. Another great gift. I do a lot of swaps and coming up with the ideas is always the hardest part. This would be a great gift Santa. Organising something like a swap wouldn’t happen for me without a few guidelines. I hope that book like this one may offer some help with the flow factor! One year my sister organised all the gals in my large extended family to get together over a table full of paper and beads and we made the prettiest cards, I was totally enamored with the creativity that flowed in that room. These are moments that I treasure, ah ha!! I have been wanting this book since it came out! I would love to start another swap with my quilty friends in the NW! This would be great for me for my bff and i to use! We would both love it! thanks! Great book! I have never done a swap before, but would love to learn more about it. I have been so looking forward to this book. Thanks for the chance! I’m always looking for new idea and a book like this is sure to help. This book is the perfect way to get into block swapping. I am just a beginner so I look for inspiration everywhere. Every book is a great source for me. I would be thankful. I would love to connect with long distance friends by working on a project together! I am just starting to build my quilting library, so this book would be a great addition for me. It would also give me a way to start a swap as I have not done one before! Would love to have this book. I do a lot of swaps and would love to have new ideas. Thanks!! I’ve not had the courage to enter a swap yet and this may be just the inspirational kick start I need! I go to embroidery club every month and would love to set up a swap with everyone there! I have lots of blocks that my Mother collected from block swaps. Sounds like fun. Swapping blocks is more fun than a person should be alol0wd to have! Hope I win…. I would love to have this book what fun! What a great idea – I love swaps. Hope I win. So sorry I missed yesterday’s giveaway. Oh how much fun this would be to get! As a rule, I only get to buy a magazine on quilting every few months – no books 🙁 SO this would come in handy! A good memory …. I had a friend start a quilt – a simple border around a lovely patterned panel … and she was to “quilt” only the panel … well, a year later, and it sits, waiting for me to finish! Each time I go visit her, I’m put in a chair, handed the quilt and a cup of tea!! 🙂 I’ll miss not having that when it’s done. What a wonderful book!! Santa I would love to be a part of a swap!!! I have been in several swaps. They are so much fun. I often thought about hosting one, but didn’t have any idea how to get started. What a wonderful inspiration book. Would be great to find in my stocking. This book is a great idea for those of us who are “organizationally challenged” when it comes to working out the details of swaps! I would love to win a copy of this book as my friend Melanie is featured in the book. I have been in swaps and they are exciting and an awesome way to make new friends! I love block swaps – haven’t done one in a few years, but have some lovely quilts from swaps! I’d love to get this book & get back into swapping. What a cute idea! I’d love to start a block swap with my friends. Oh my gosh, this Sew to Swap book would be perfect for our family gals and friends, that all gather at least one weekend each year from all over Texas to work on projects, have a sleep over and cluck around, I already have the Ten Little Things bundle in my moda shopping cart so this would be perfect for us to put together, I hope santas leaves me a copy in my Stocking, it looks like such a fun book! It looks like a great book to own! I would put it to good use! 2011 was the year I decided to learn how to quilt… in large part because of the Cluck Cluck Sew blog. I made one of her pillows (based on a google search) and started looking at her site. Little did I know the enormity of the quilt blogging community. I’ve learned a lot about quilting from the blogging community and I think I could learn a lot from this book! This book looks great, not been part of a fabric swap, but other crafting swaps and they are always fun. Thanks. Our guild is small (only 17 members) so we have a blast when we get together for a workshop and this book would provide some great ideas for us to work on! We have even started on a Friday evening and worked WAY into the night and then returned to finish on Saturday – order in pizza and party on! I love a new book to inspire me. My BQFF (best quilty friend forever) also is a great inspiration and so awesome to shop with. Our tastes are so different that we never fight over the same fabrics and we help each other look at things from a different perspective. With so many swaps and online friends this book would be great for getting ideas on what to send! I would love to win a copy of the book so I’d be inspired to do another swap either online or with my guild! I enjoyed doing the 3×6 Bee on Flickr…just have to put my blocks together into a quilt. Belong to a friendship quilt group-The Fireside Quilters and we are always for new ideas for swaps and challenges-this book sounds like it sure would give us plenty of new ideas. I sure would love to win it-thanks for the opportunity! I’d like this book with all of the good ideas for quilts. We have a group that just gets together to sew and quilt, but have been talking about organizing a project we could all do together..This would be perfect!! My quilt guild does a block swap every other month and I love the different blocks that are created. I could use some fresh ideas on new blocks. Looks like a wonderful book! I have some local friends that I quilt with, but there are several that have moved away and this would have some great projects to join the locals with those who have moved away. Thanks again! I am in a friendship group and that would be a fun activity to trade blocks. I always have fun at our friendship group meetings. Swaps look like great fun. It would be wonderful to have this book. I have lots of memories of my friend coming to visit and helping me with my first big quilt and teaching me so many things about quilting. I have done some swaps and it would be fun to have new patterns and ideas to use for group swaps. I have never done a swap before, but would love to start! a good book [followed it’s bloghop review] to have! would love to win it and slip it into my sis’ stocking. i went with her and a few others on a fart [fabric acquisition road trip] to homer, way on the other side of our peninsula,to do the quilt shops there. we splurged on goodies and lunch, took fabulous pictures on the way, enjoyed ourselves tremendously. I have just signed up for a couple of bees and this would be perfect for that. One of fav memories is a trip away to the beach with some good friends of ours….a week of sun, sand and laughter. This would be the perfect book for my sewing group to find a project to swap. sounds like so much fun! Thanks! Santa, I’ve wondered about swaps and blocks and how to do one. Would you please leave this book in my stocking? pretty please with a cherry on top? Thank you Santa. I can see my mother and Aunts trading blocks around to make a family quilt! So I would love to see what (mostly) Flickr folks created for this book and learn from them! I have not done a swap yet and have talked about it with my sewing group. It would be awesome to have some direction. I’ve never done a swap before, I just never really think my things are good enough yet to swap with anyone. I am a follower. OMGoodness, Ive sew been longing to do a Friends Quilt and this would be the perfect stocking stuffer to get me and my friends going! Thanks for the chance!!! I’ve never participated in a block swap before, but it looks like it would be fun. Please bring me a copy of this book Santa. We have been talking about doing a swap, this book just might get us going. What a great book, I’ve looked at swaps on various blogs and been tempted to join in. This book would definitely help. This book sounds perfect for our little group to help make 2012 a swapping good year. Love swaps. Thank you for the giveaway. A group of us meet yearly for a retreat and this might be something fun to do! I look forward to sewing with these ladies every year – and eating lots of jellybeans! This would be great fun for our small sewing group – the Queen Bee Quilters—-AKA QBQ’s. I have always wanted to do a block swap…this book looks great! No better reason to get together with your friends then some great projects! This book would be great for my library, or make a great gift for a friend!! My best memories are from when I give a handmade gift to family or friends. Doing things with others is always lots of fun. I participate in many swaps on several of my favorite sites-wouldn’t it be wonderful to have this book for some great new ideas!! I have done swaps before and it is fun. This book would be a great launching off point for an exchange. I participated in a world wide swap and the quilt I made is my most treasured! I have signatures and fabrics from all over the world!! I would love to win this book. My best friends and I met because of quilting. Thanks for the giveaway! I would love to do my first swap with some friends! Love this giveaway!! I love quilt books – my 3 sisters & I do block exchanges – so this book would be perfect for me. Thanks for the chance to win. I would love to do some swaps so this would be great! This would be a motivating way to begin quilting, which has been on my “want to do” list for more than a year now! I have a wonderful group of quilting/sewing friends – this book would be a joy to share with them and help us start an exchange! Very fun!! I love to swap blocks! I can’t wait!!! I love swaps and it would be wonderful if Santa brought me the book so I could learn from the experts how to personalize each swap item. A special memory with a friend was taking a ten day trip to Hawaii together before either of us were engaged. This book looks so exciting. Sharing ideas makes life richer. The Sew to Swap book would definitely be put to good use. Thanks for sharing. Sew much fun! We’ve been talking about doing a block swap at our shop! This book could be great to get that started!!! The swap book sounds like lots of fun…..I would love to have it in my stocking. The swap book looks great.Thanks for sharing!! 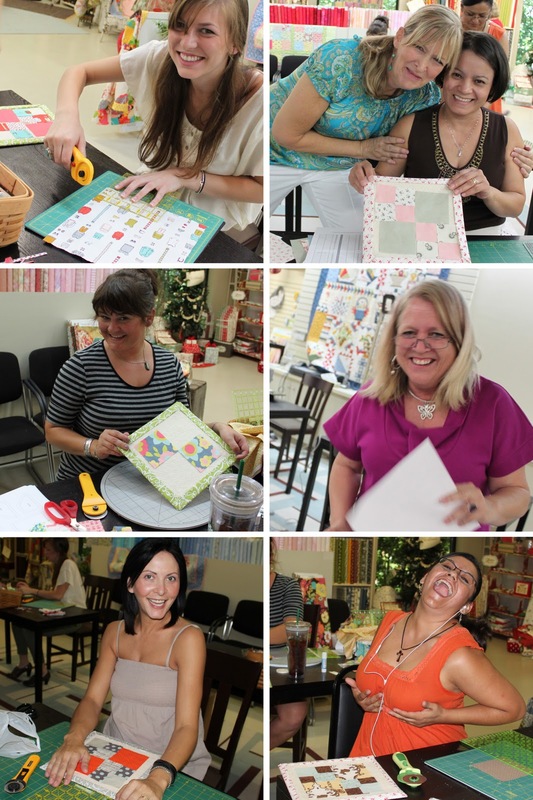 The book looks like a lot of fun–it’s always a great time swapping with my quilty friends! I’m always up for a good book! Cluck, Cluck, Sew is one of my most favorite blogs. She does great tutorials! Would love this book, and could maybe get some friends interested in quilting with me! It’s been years since I participated in a block swap..perhaps this is the push needed to try another. My little sewing group could use a pick-me-up….thinking this book would help us out. Thanks for a chance to win! I know there would be alot of ideas within that book that I could share with my sewing group! Perhaps Santa will get my hint…..!!! Love the swaps/quilt alongs going around the web….need a new project for the new year. Thanks! I’d love this book because I have LOTS of swap blocks and need ideas on how to use them! And I am always looking for new swap ideas for a group I belong to. sounds like fun! love the idea of a block swap. Allison’s patterns just get better and better! This book looks great, I’d love to win it for a dear quilting buddy! Some of my best memories are swaps with bee friends over the years. Thanks for the giveaway! What a neat book. I love the idea, but have never participated in one. Would love to get the Girl Scouts I work with to try this…each have a block that they “perfect” construction on by dooing many and swap w/ others to make samplers…and you know GS love SWAPS! Quilting and friends are the best. Everyday is a quilt day when you work in a shop and meet so many friends. You Moda gals seem to be having a blast! This book looks like the key. I cannot find my comments I hope I am doing this right. Swaps are the best, such a great way to share and meet other quilters. I have this book “The Farmer’s Wife”, and love it. I’ve made 46 of the 111 I need for the queen size quilt. I’m sewing it entirely by hand (I’m even going to do the sashing by hand), and I’m going to hand quilt it also. Maybe I should ask for prayer! My quilting friends are the best. We would love to do a swap! We’ve been looking for something new to do at my LQS..this may be the perfect thing. So…Santa…how about helping a quilter out. I have seen some of the blocks from other blogs, they are soo cool. A swap sounds fun!!! You can nver have too many projects going at one time, specially if you shate them with friends. What a beutiful quilt!! Love the idea of swaps!! I would love to use this book for a swap for my small group. It looks so fun! This quilt book would be wonderful to use in my quilt group. We are always looking for fun, new projects to do as a group. Thanks for the great giveaaway. I participate in swaps online, and would love the additional inspiration. I’d love to join in a swap–I’ve never done one before. There are no quilt shops/groups around me but I could search for one online. This book would be a neat way to begin! I’ve done a few swaps. This book looks like fun! I’m hoping the winner likes it! Santa Santa can you hear me? A book Santa about quilting, what can I say but that I would love to own one and especially if it wound up in my stocking. I have been getting more and more interested in doing a swap. So getting this in my stocking would be great. Good memory with friends-Quilters Night Out – laughing, sewing, and then half price appetizers at Applebees! This book is definitely on my Christmas list! I haven’t participated in a quilt swap cos it’s a little scary for a beginning quilter; this might be the help I need. It would make a very Merry Christmas to find this in my stocking. Count me in on the fun! Thanks for the chance to win. I have done several swaps (completed items) but never a blocks swap. I have been thinking about hosting one. BUT I want something unique. Maybe this book will help. I would love to receive this book!! I have a couple good friends that sew and we’re in our mid 20’s and we are always trying to come up with new crafts to do together! I could start a swap with my Facebook buddies. Pick me Pick me! 🙂 I’s love to have fun with this book too! I’ve never been involved in a swap before. Sounds fun…need some quilting friends. I have been participating in online swaps for a few years now, and have always enjoyed the experience. My first wasn’t actually a swap, a group was making a quilt to raise funds for breast cancer research, and we all contributed blocks. The quilt was beautiful. Love this! I participate in some online swaps already and just love the concept of this book. Swapping is fun! I haven’t joined one for a while but have always loved to be part of that community! I need this! I need reasons to make more, and this would do it. I have a sewing group I need to start back up with, and they might like this too! I am new to quilting, and need all the help & ideas I can get. Would be a fun idea. I quilt with a couple groups of ladies and we could have a great time with this. I like swap … And books ! I would love to be a part of a block swap, and this book looks great! Thanks for the giveaway! I’m sorry I missed this one! 🙁 But it looks like a great book! THanks for all the chances to win! This has been a great event! Once I am more confident in my quilting skills I can see this book being an invaluable tool in learning more about block swaps and more. I’m going to keep this title in my list of things to check out later down the road. This would make a great stocking stuffer! This 12 Days of Christmas has been fun. Thanks for all the fun, and great prizes. I have learned lots too. No idea which ones I entered so I am just making sure I comment on all 🙂 So sad I missed this one! Can’t wait to see who wins!! Thanks!! A quilter needs lots of books for when she needs to rest!